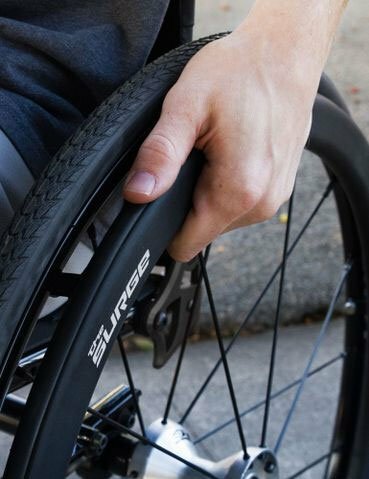 Price is not the only thing that matters when it comes to buying The Surge Wheelchair Handrims by Out-Front, live customer service is priceless! Whether the Surge and the Surge LT suits you, you will receive the same all-in-one oval with the Gription Strip. There is one difference between the two, and that is the size and weight of the oval. The Surge employs a larger profile oval that measures 1 1/2” long (top to bottom) with a weight of 20 ounces. 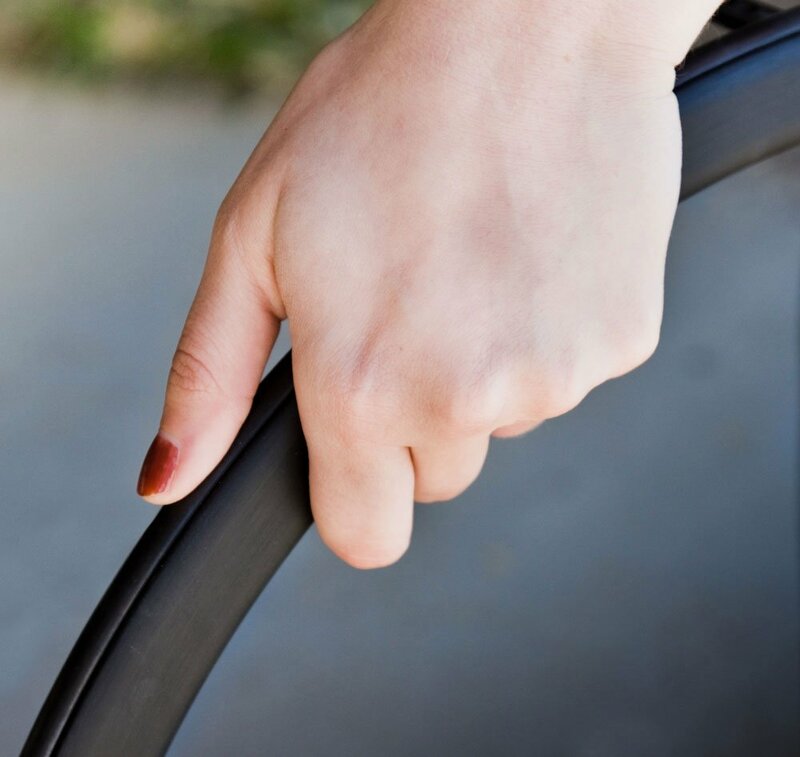 A smaller profile oval graces the Surge LT (a smaller gripping surface for those with smaller hands) and boasts a lighter weight. The length of the Surge LT is 1 1/8”, and it weighs only 16 ounces – just a hair more than a standard, uncoated handrim (which typically weighs 13-15 ounces). Fits on all wheel sizes from 20" to 26"
I switched from vinyl coated to these after trying regular pushrims and the regular natural fit. This gives me grip when I push and lets me slow down without building up a lot of friction. I feel like I get a little extra "umph" with the Natural fit shape. 32 years as a t9 para, owned more chairs than I can count. I have 2 tiLits ZR's both with Surges. This is the 1st major invention in pushing technology that works so good you will NEVER be ableto be without them, and you will wonder how you lived without them so far. There is an inset along the rim that "effectively" holds a glorified rubber band. Its a thick, great feeling rubbery grip along the top, it gets better the more you use it. Im thinking I can get several years out of the band. Then order another band and replace it. If the entire rim is grippy you burn your hands when you stop, its was all or nothing. Now Natural Fit has done it and why no one figured it out before this is amazing, its like the iPod, obvious only after its created. 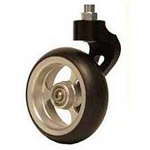 The actual value of these rims in terms of making your life easier, saving grop tension, preventing carpul etc. is ten times the retail cost. All I can say is, thank you Natural Fit, Sincerely Thanks! Functionality is amazing but the grip strip started pealing pretty quickly. I sent a message to Out-Front suggesting improvent in the adhesion process and they assured me they had along with sending a replacement set IMMEDIATELY no questions asked!!! Amazing company and I look forward to dealing with them again!! Disadvantages: Pealing grip which I've been assured had been greatly improved! Update four years later using the same surge rims. I am still using the same pair of Surge rims I got four years ago; I may get a new pair. But thats only because the black metal rim portion has scratches and doesn't look as clean any longer. I will put the old pair on my house chair. I heard mentions of hands getting dirty. Thats part of pushing a chair, you wash your hands more. However, the rubber band is a magnet for dirt. There is an easy fix. 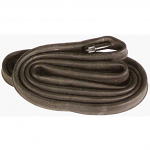 A cloth with soap, water and push the cloth against the rubber rim and roll 10 feet forward holding constant pressure, then back with same force, the cloth will be black from dirt. You do this every Weekend or more, and your hands stay clean. Advantages: The advantages outweigh and negative. I travel the world for work is often going up hills, San Fransisco style roads in Stockholm, London, etc. 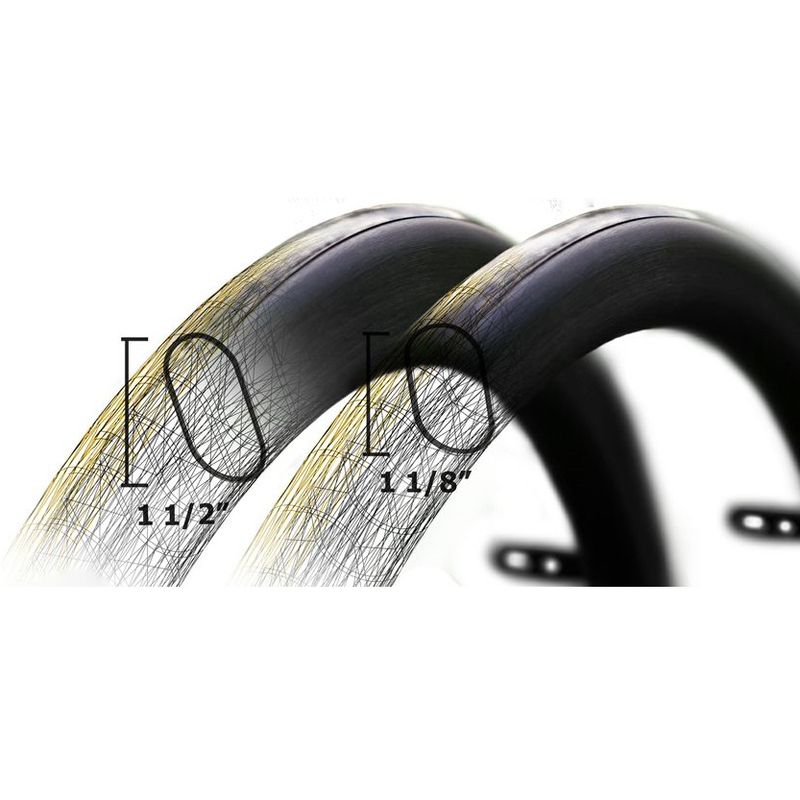 The rubber ring enables the torque needed to go uphill. 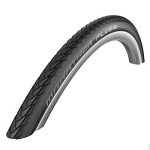 I first had the Naural Fit nonrubber rim; I was unable to get the grip without gloves. I also spoke to the designer, he answered my email at the manufacture, and he called me. He is very motivated to make the best rims possible and asked for suggestions. I think he is a thoughtful and well-meaning designer with the goal of perfection. Disadvantages: I also keep a super glue bottle, the one with a little brush in it in my backpack. After about three years some of the original rubber band adhesive can come off in a 1-2 inch area. It's the twisting torque energy that can cause a small part to loosen. Get out the super glue, place it under the loose rubber band. That rubber band won't move for another three years. All parts of a chair need maintenence. I even put in new bearing in my front and back wheels every 18 months. Love them when they are new! you can push better than the standard natural fit. Advantages: Rubber does not burn your hands when breaking. 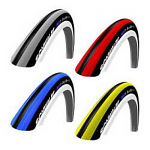 Disadvantages: the rubber stretches and can come off the handrims and nobody sell a replacement, so you have to buy a new set of handrims when they finally fail. I have been purchasing these gloves from SportAid for over 20 years and they are the best of any others on the market that I can find. My level of SCI is 5/6 complete. Thank you very much Sport!